A parish workhouse existed Ilfracombe from around 1740 (Hitchcock, 1985). A parliamentary report of 1777 recorded parish workhouses in operation at Barnstaple (for up to 80 inmates), Ashford (12), Berryn Harbour (12), Comb Martin (2), Heanton-punchardson (16), Ilfordcombe (60), and Pilton (30). Devon: Ashford, Arlington, Atherington, Barnstaple (5), Berryn Arbor, Bittadon, Bishops Tawton, Braunton (2), Bratton Fleming, Brendon, Challacombe, Combe Martin (2), Countisbury, East Down, Fremington, Goodleigh, Georgeham, Heanton Punchardson, Horwood, High Bray, Ilfracombe (3), Instow, Kentisbury, Landkey, Linton, Loxhore, Marwood, Martinhoe, Morthoe, Newton Tracey, Paracombe, Pilton (2), Sherwill, Stoke Rivers, Swymbridge (2), Tawstock, Trentishoe, West Down, Westleigh. In 1894, Pilton was divided into East Pilton and West Pilton. A large chapel was erected at the north-west corner of the workhouse. This is now all that survives of the building. 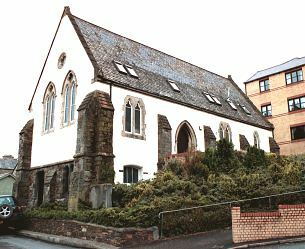 Barnstaple chapel from the south-west, 2001. From 1904, to protect them from disadvantage in later life, the birth certificates for those born in the workhouse gave its address just as 19 Alexandra Road, Barnstaple. The workhouse later became Barnstaple Public Assistance Institution and then after the inauguration of the National Health Service in 1948 it became Alexandra Hospital until finally closing in 1978. In the early 1900s, the union established a group of thee children's cottage homes near to the workhouse on Alexandra Road, Barnstaple. The homes could accommodate a total of 50 children. North Devon Record Office, Tuly Street, Barnstaple, EX31 1EL. Relatively few local records survive — holdings include: Guardians' minute books (1855-1927, with gaps); Collector's receipts and payments (1845-1950); etc.